Are you paying more for the same item? Students learned about where their food really comes from. 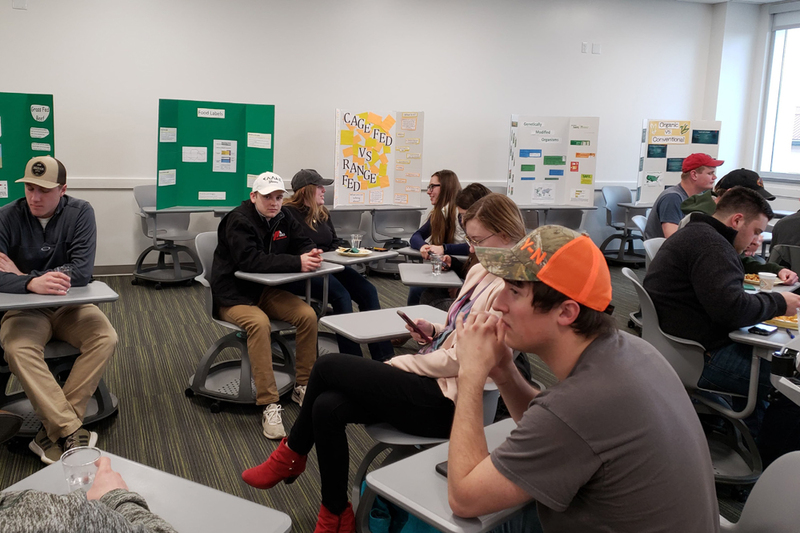 The North Dakota State Collegiate Future Farmers of America and NDSU Collegiate Farm Bureau hosted a food information forum to discuss pertinent topics in the agriculture and food industries as part of Ag Week on April 10. A panel of four experts discussed how modern U.S. labeling uses a confusing system. The panel and audiences discussed differences between genetically modified organisms (GMO) and non-GMO products, specific definitions of agricultural products, different laws between states about product labeling and differences between conventional, organic and all-natural farming. One of the panelists, Dahltin Pahl, a recent agricultural economics graduate of NDSU, spoke about some major concerns that he said he sees in modernized fear-based labeling. A lot of consumer products that say non-GMO don’t have GMOs in them in the first place. Pahl expressed his concern behind the modern issue of fear-based labeling and the matter of how important it is for consumers to be educated about the product they are consuming. Currently, the U.S. only allows 10 crops to be genetically modified. They are squash, soybeans, corn, cotton, papaya, canola, alfalfa, sugar beets, potatoes and apples. Panelists also discussed problems with food labeling laws that go beyond GMOs. Currently, there is no federal law that restricts the labeling of the food product. All four panelists agreed that consistency is important and the process of proper labeling will take time due to the paper process. “I live right along the North Dakota and South Dakota border. So, if I’m in one state buying something and if it’s labeled differently, then it’s exactly the same product in South Dakota, I’m going to assume there is a difference in the products when there isn’t,” Pahl said. Mark Jirik, director of Northern Crops Institute, pointed out the flaws of organic labeling. He shared the story about an organic farmer he used to do a business with.